Some motorists in Louisiana receive a flyer in the mail after they get a ticket, allowing them to take an online course and pay a fee in exchange for having the ticket dropped. Local district attorneys can keep the money raised by these traffic diversion programs, but one has decided to share some of the money with the local public defender. Public defenders these programs for reducing their funding from court fees. Sheriffs, court clerks, public defenders and other criminal justice agencies in Louisiana have been losing revenue because courts are handling fewer traffic tickets. Some blame a growing program that allows district attorneys to drop tickets if drivers write them a check. Those drivers don’t end up paying court costs, which is what those agencies, particularly public defenders, rely on for funding. However, one DA has decided to start splitting his revenue with the local public defender. Public defenders around the state have complained about underfunding for years. More than a dozen judicial districts, including the one in New Orleans, have taken drastic measures such as refusing new cases, putting defendants on a waiting list or laying off attorneys. Calcasieu chief public defender Harry Fontenot said his office has been more stable since DeRosier started sharing diversion revenue in April. “We are now in a better financial position than we ever have been,” he said. The Lens reported on the growing practice of traffic diversion last summer. These programs are modeled on pretrial diversion programs for criminal cases, in which prosecutors drop charges for first-time or nonviolent offenders if they participate in programs like counseling or drug rehab. With traffic diversion, offenders are spared not from jail time, but from court costs and points on their license that could drive up insurance premiums. Some jurisdictions simply require drivers to pay a fee to the DA’s office. Others also require them to complete an online class or read a pamphlet on safe driving. No state agency tracks these programs, so it’s hard to get a handle on how many tickets are diverted, how much they bring in, and what the DAs do with the money. Last summer, The Lens asked seven district attorneys, covering 11 parishes, for records on their traffic diversion programs. Six complied with the law and provided records. They were diverting up to half of their traffic tickets, according to the documents. Several DAs said their programs are growing. The DA for East and West Feliciana parishes said he created the program to bring in more money, and it was — he had to hire someone to handle the work. “It’s an industry that we created,” District Attorney Sam D’Aquilla said. His office has diverted 45 percent of all traffic tickets since 2013. The number of traffic tickets handled in the local court dropped 35 percent over five years, according to data collected by the state Supreme Court. Statewide, there has been a 30 percent drop in tickets processed by courts over the past five years, according to the Supreme Court. DAs in Orleans and Jefferson parishes don’t run traffic diversion programs. 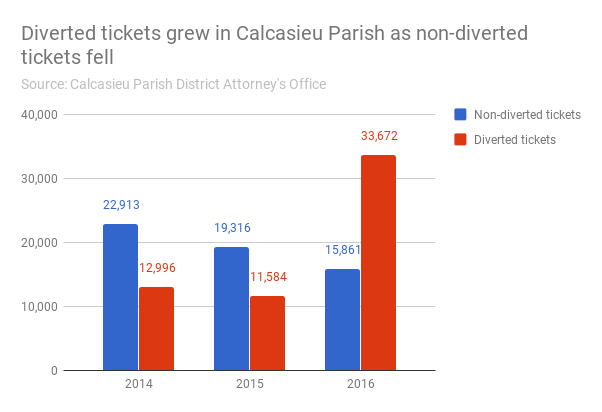 In Calcasieu Parish, the number of tickets in court dropped by about 21 percent from 2014 to 2016. Diverted tickets — the ones in which the DA collects the money — more than doubled. Fontenot’s office started to get a share of the money in April, but he didn’t know that because it was categorized under a different program. Under that program, called LACE, DeRosier’s office pays police officers overtime to write traffic tickets. He diverts most of those tickets. Back in 2010, DeRosier offered the public defender’s office a cut of revenue from diverted tickets, but Mitchell Bergeron, the chief public defender at the time, declined. Bergeron said he couldn’t remember why. The unsigned agreement acknowledges that the DA’s traffic intervention program may reduce funding for the public defender’s office. It offered 20 percent of the proceeds from one program as long as the public defender’s office kept the DA apprised of its cases and defendants. In 2016, the Louisiana Legislative Auditor published a report on district attorneys’ revenue, including diversion fees. Because the DAs didn’t provide enough information or report their revenue in the same way, the auditor’s office said it was unable to say definitively how much money they raised. The agency is now investigating traffic diversion and LACE in DeSoto Parish, according to Roger Harris, the director of investigative audits. Last year, state Rep. Denise Marcelle (D-Baton Rouge) proposed a bill that would have required prosecutors to share financial information on their diversion programs and split the revenue with other agencies. But she dropped it under pressure from the Louisiana District Attorneys Association. “I didn’t understand why they wouldn’t want an oversight committee,” she said. Pete Adams, executive director of the association, said in an email the bill would have infringed on prosecutorial discretion, which is part of the state constitution. He pointed out that the association created a set of standards for pretrial diversion programs back in 2000, though they are not legally binding. In Minnesota, traffic diversion programs similar to the ones in Louisiana were declared illegal because they weren’t authorized under state law. But in Louisiana, district attorneys say they fall under the umbrella of prosecutorial discretion, which allows them to pursue or decline to pursue any case as they see fit. State law does authorize DAs to collect pretrial diversion fees in order to support pretrial diversion and victim assistance programs. Adams said many different costs could be considered for victims services or diversion.